Understanding the planet's history is crucial if we are to predict its future. While some records are preserved in ice cores or tree rings, other records of the climate's ancient past are buried deep in the seafloor. An increasingly popular method to deduce historic sea surface temperatures uses sediment-entombed bodies of marine archaea, one of Earth's most ancient and resilient creatures, as a 150-million-year record of ocean temperatures. While other measures have gaps, this one is increasingly popular because it promises to fill in gaps to provide a near-global record of ocean temperatures going back to the age of the dinosaurs. But University of Washington research shows this measure has a major hitch: The single-celled organism's growth varies based on changes in ocean oxygen levels. Results published in August in the Proceedings of the National Academy of Sciences show that oxygen deprivation can alter the temperature calculations by as much as 21 degrees Celsius. "It turned out that oxygen has a huge, dramatic effect," said corresponding author Anitra Ingalls, a UW associate professor of oceanography. "It's a big problem." Recent research shows these archaea, which draw energy from mere whiffs of ammonia, make up about 20 percent of microbial life in the oceans. Their bodies are plentiful in the ocean floor. A method established in 2002 uses fats in the archaea's cell membrane to measure past ocean temperatures, including during a major warming event about 56 million years ago that is one of the best historical analogs for present-day climate change, and a sudden oceanic cooling of up to 11 degrees Celsius during a period of low ocean oxygen about 100 million years ago, when other records are scarce. Climate scientists found they could measure ocean temperature by looking at the change in the TEX-86 index, a temperature proxy named for the 86-carbon lipids in the cell membrane, which often tracks the surrounding water temperature. The method seems to work better in some samples than others, prompting Ingalls and her co-authors to wonder about its physiological basis. The newly published experiments tested that relationship and found an unexpectedly strong response to low oxygen. "Changing the oxygen gives us as much as 21 degree Celsius shift in the reading," said first author Wei Qin, a UW doctoral student in civil and environmental engineering. "That's solid evidence that it's not just a temperature index." This means the TEX-86 measurements are inaccurate in parts of the ocean that may have experienced oxygen changes at the same time—for example, in low-oxygen zones or during major extinction events. This is exactly when the archaea are a popular index since other life forms, whose shells can provide a chemical signature for their growth temperatures, are absent. It's not known exactly why the archaea shift their lipid membranes. They may adapt to a temperature change by making their membrane tighter or less brittle in the new environment, Ingalls said. Low oxygen is another big environmental stressor. "The envelope that encloses the cell is sort of the gatekeeper, and when stress is encountered of any kind, that membrane needs to adjust," Ingalls said. The new study is the first to actually look at how these archaea grow in different temperatures. These archaea are famously hardy—it's the same group that lives in Yellowstone hot springs—but they have stymied attempts to grow them in captivity. 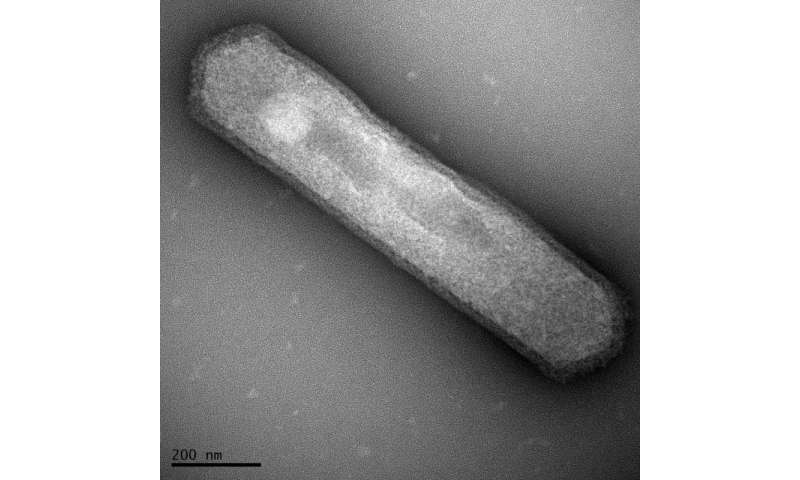 Qin was first author of a 2014 study that was the first to grow and compare individual strains of the marine Thaumarchaeota archaea under different conditions. He used samples from Puget Sound, a Seattle beach and a tropical-water tank at the Seattle Aquarium to show that related strains occupy a wide range of ecological niches. In the new paper, he shows that the membrane lipids of different strains can have different temperature dependences. Some of them are a straight line, meaning they would be a good indication of past temperature, but others are not. He also did experiments in which he changed the oxygen concentration of the air above the culture flasks. Results show that as the oxygen level drops, the TEX-86 measures rise dramatically, with reading spanning 15 to 36 degrees C even though all samples were grown at 26 C.
"This index provides an amazing historical record, but it's very important how you understand it," Qin said. "Otherwise it could be misleading." Knowing that oxygen affects the membrane structure can help improve interpretation of the TEX-86 record. Researchers can disregard samples from low-oxygen water to improve the accuracy of the technique, which as it is used now has error bars of about 2 degrees C.
"Plus or minus 2 degrees is not very good when you think about the sensitivity of the climate system," Ingalls said. "This gives us a new way of thinking about the data." Next, the UW team hopes to do more experiments to learn how other factors, like nutrient levels and pH, affect these archaea's metabolisms. 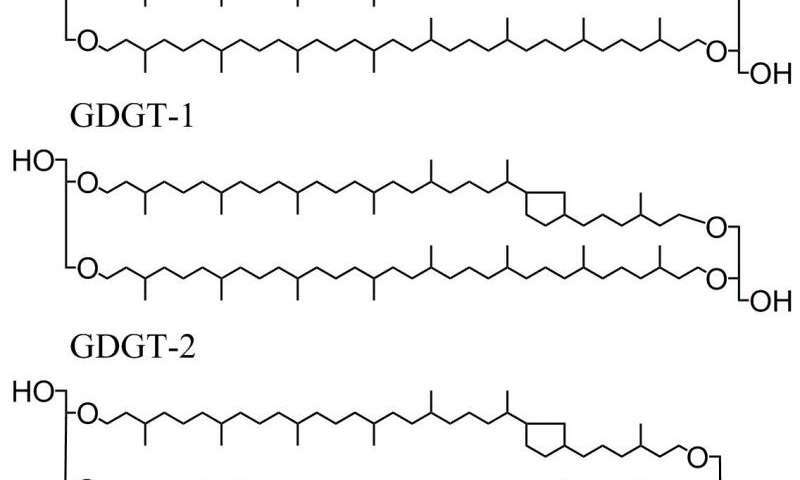 "We think there's reason to believe that there's all kinds of things that could affect the membrane lipid composition, not just temperature," Ingalls said.